1. Fight the Good Fight - Option 1 is for the parties to continue to "fight the good fight", hoping that one of them emerges the most viable alternative to the Tory government. All current party leaders appear to favour this course, although possible replacements to Kevin Taft (including David Swann) have mused about reaching across party lines. 2. Unite the Left - A second option is to formally fuse various organizations into a United Left party. Proponents of this approach hold the Harper Conservatives and Saskatchewan Party as models. Unfortunately for the Alberta opposition, such parallels are less than helpful. Formed in 1997 by a right-wing, anti-NDP coalition of former Liberals, Conservatives and Reformers, the Sask Party built on a long history of (albeit modest) success by the right-wing parties in the province. Left-leaning parties have no such foundation in Alberta. 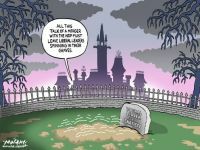 What is more, across Canada and throughout history, Liberals and New Democrats have run heated campaigns against one another. The New Democrats consistently portray the Liberals as "Tory Twins," while the latter paint the former as "socialists." It would take decades (more) of Tory rule to make many party stalwarts rethink this tack, as any formal merger would look hypocritical, at best. 4. Vote Swapping - In the absence of an elite-level "riding swap", electors could opt for a grass-roots "vote swap" strategy. This has been discussed at-length elsewhere on this site. Its effectiveness in solving the collective action problem, or serving as an alternative to electoral reform, remains to be seen. 5. A Citizen's Committee - In the absence of an elite-level agreement or grassroots movement, there is a fifth option - one that remains open to party members, union leaders, interest groups, and disgruntled voters, in general. The lesson comes from Manitoba, where a group of Liberals and Tories revolted against their parties' leadership in the early 1970s. Dissatisfied with the lack of a united right-wing alternative to the governing New Democrats, these individuals - acting under the Independent Citizens' Committee banner - decided to take matters into their own hands. They took out full-page advertisements in provincial newspapers, "informing" voters as to which candidate had the best chance of defeating the incumbent in each NDP district. These ads angered party leaders - not to mention those contestants left off the list of favored candidates. Yet, the leaders responded by negotiating several late, saw-off deals. While not immediately successful in unseating the government, the strategy did help set the stage for a right-wing resurgence in 1977, when Sterling Lyon returned the Tories to power. These are but five of several alternatives open to those seeking to "Stop Harper," or bring new faces to the Alberta Legislature. If history is any guide, the task is fraught with both challenges and opportunities.